On our trips to Rio de Janeiro, the one restaurant that we have started to think of as "our living room" is Garota. Mauricio is from Rio, a true carioca. This was a place he would frequent before moving to the U.S. Situated in the tranquil neighborhood of Urca, it has an extensive menu and a beautiful view of Enseada de Botafogo (Botafogo Cove) and Cristo (Chris the Redeemer), and the waiters still wear button-down shirts and dress pants. As a tourist, Urca is the one neighborhood where I always feel safe. You see local residents with their families out for dinner, and in the early afternoon can see the neighborhood children walking home from school. If you read comments and reviews online, it seems Garota is popular with tourists as a pizzeria. Yes, the sign outside says "Restaurante, Bar, Pizzaria" but I have never eaten pizza there. Anyone who has gone to Garota and has not experienced the authentic Brazilian food, has wasted a trip. Or more correctly, should go again! When you arrive and select a table, unless you actually think you have to wait for one to be selected for you, one of the waiters will place a paper table cover on your table. While this may make you think less of the place, there is a purpose for these specific covers. 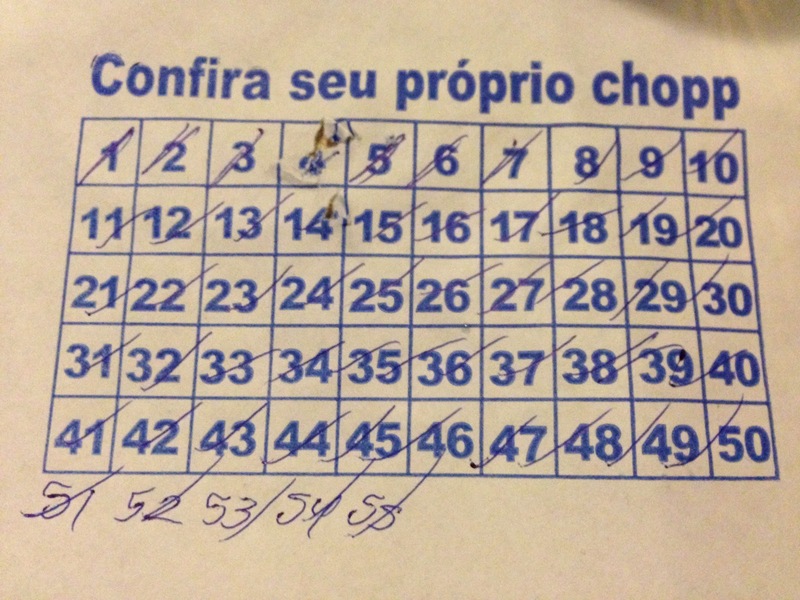 You see, there is a drink in Rio called "chopp". Pronounced "show-pee". It is a light beer served very cold, usually in small cups. 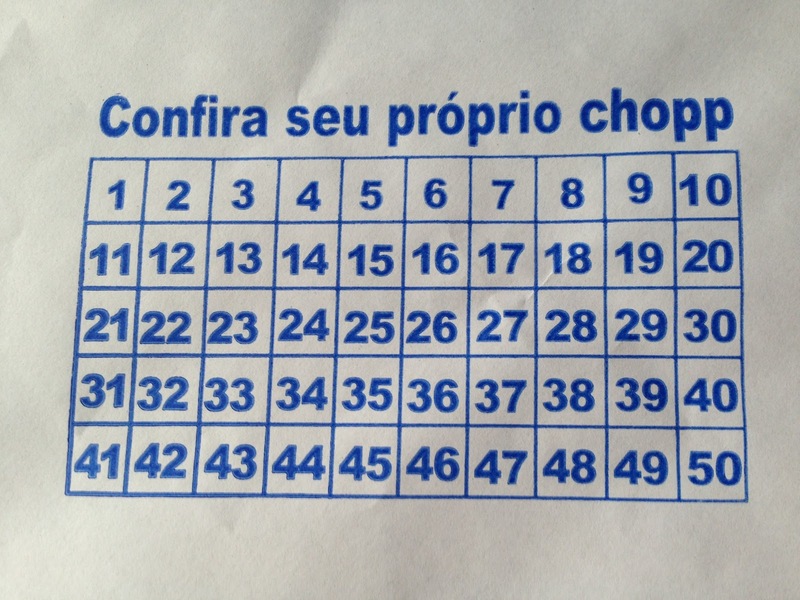 You can order large or half chopp. 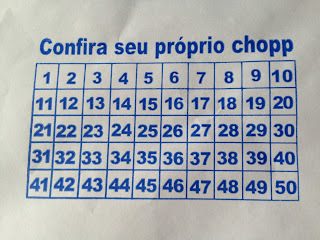 Using this paper, you can keep track of how many chopp you and your party have consumed! See below. Yes, there are times when we have to add numbers depending on how many hours we have spent there and how many people have stopped by. This is a fun way to keep tabs on your tab. As you can see, they bring a gas powered flat iron to your table loaded with meat. If you like it rare, pull everything off and then put back the pieces individually to cook. Just look at how beautiful that is. 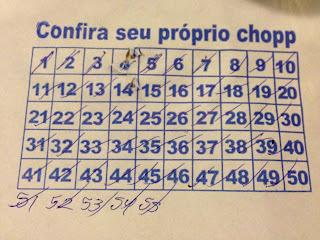 You will pay a fraction of the price you would pay at one of those touristy churrascarias like Fogo de Chão. There is nothing quite like a Brazilian picana. Any steak lover should experience this. After you have eaten your fill, and are ready to sit back with your chopp, ask the bartender if you can take your chopp over to the wall. Sit down and join the dozens of cariocas who have arrived at dusk to meet up with their amigos and have a few drinks at the water's edge. Then you will have experienced the real, authentic Urca.